Posted on Fri, Mar 9, 2012 : 11:19 p.m. 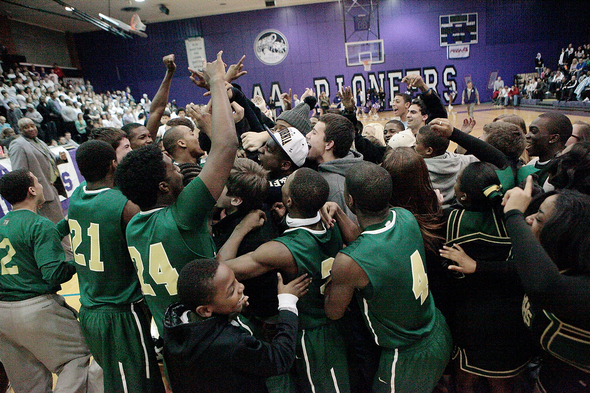 The Huron boys basketball team celebrates its fourth consecutive Class A district title on Friday night. The River Rats topped Pioneer, 61-48, on the Pioneers' home court. For Huron High School, good things come in threes, but history comes in fours. With a 61-48 win over Pioneer in Friday’s Class A district final, the River Rats won their fourth straight title. They’ll play Orchard Lake St. Mary’s in a regional semifinal on Monday. Huron had won three straight district championships three previous times. In 43 years of Huron basketball, this is the first time it has won four in a row. The 2012 senior class is a part of history. “We talked about that (Thursday),” Huron coach Waleed Samaha said. “That was important, to set yourself apart as a class. The River Rats (17-6) needed most of their seven-man senior class to do it. Mike Lewis and Andre Bond led the way for most of the season. Friday, Lewis had a game-high 18 while Bond chipped in 12. But after amassing an eight-point lead early in the second quarter, both sat until halftime with two fouls. With two of its leaders out, Huron found two more. After Pioneer cut the lead to four, Allen Thomas, another senior, scored six straight points. “I’m like, ‘Mike and Dre are out. Now, I got to step up,’ ” Thomas said. “So I just started scoring to make up from them being out. Kendall Thomas, also a senior, scored the other four in Huron’s 10-3 run to end the half, which extended its lead from eight to 11, with two of its stars on the bench. After battling injuries early in the season, this last game against the cross-town rival meant a little more to Thomas. The stat book noticed the impact. Thomas finished with 16 points. Pioneer coach Rex Stanczak noticed the impact. He singled out Thomas as a difference maker in the first half when Huron built the lead it never gave up. Ja'Korey Davis led Pioneer (15-7) with 14 points. Jibreel Hussein added 12 and Jimmy Holman 10. When Lewis and Bond did come back, they stopped any late Pioneer run before it could get going. The two combined for 12 of their team’s 18 points in the fourth quarter. At the end of it all, during the trophy presentation, the PA announcer gave the order for Samaha to come up and accept the trophy. Samaha remained standing off to the side. Instead, Lewis, Bond and Kendall Thomas received the trophy and brought it to their teammates. The lengthy celebration consisted of constant displays of four fingers in the air to celebrate the team’s historic run. But after Samaha’s mandated 24-hour grace period passes, they’ll realize four will stand for something else: the number of wins in order to reach the state finals. Michael Florek covers sports for AnnArbor.com. Contact him at michaelflorek@annarbor.com.